Its been quiet on the Sonic Masala front this week, I must admit. We are still yet to post the Naked On The Vague/Grass Widow/Wetdog gig review and photos, although I wrote it the day after, plus the level of inactivity after our big breakthrough interview on..erm, Breakthru Radio on Thursday is a little disconcerting (check it out here - its The Anatomy Of A Blogger show on 14/10/10). On top of being embarrassed by my unease when in the hot seat (although in context, it was rushed, I had a bus to catch to Cambridge in less than an hour), both Paul and I have been inundated by outside influences - AKA work. So the only way to get back on the horse, is to saddle up to our staple Friday Cover Up. Today Im in charge, so Im going for someone who is much more obscure but much loved here in my dusty corner of the SM world. Sweet Lights self released a self titled album a little while ago (which you can grab here) that was a beautiful pastiche of eclectic pop workings that stick to you like prickles in your socks. Now he has released a cover, and I must say I was floored. Its not an overly redefining working of the track rather than the choice of cover - the Travelling Wilburys. I actually found myself grinning for the entirety of the first listen, then immediately played it again - a win in my books. And while Im at it, remember the clip Sweet Lights made for his track 'Message On The Wire'? The lil Scott Baio kid breakdancing his arse off? Well, believe it or not, that handy breakin action is actually Mr Sweet Lights himself as a kid - amazing! Id want to launch that on the world too - all I was good at was falling off my BMX and drawing kick-arse vehicles of death with rockets and machine guns, that somehow came off looking like clogs. And now he has patched up a vid for another track, ''You Won't Be There' - a lil homage to John and Yoko. And seeing as the bearded weird One would have hit 70 just a week ago, its a fitting touch - he truly is a sweet structuralist of pop music. Enjoy the weekend SMers! 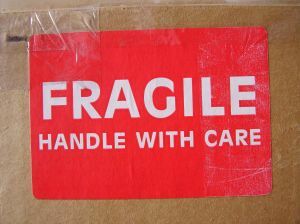 "handle with care" is absolutely stunning. thanks, so perfect for right now. just gorgeous.